As the title of the effect suggests, you as the performer, are able to lift with your bare hand, a bunch of cards arranged in a rosette fashion. Ryan Schlutz has incorporated a card revelation in this in as well. In actual effect, here is what happens. A spectator freely selects a card. It is then lost in the deck. The performer takes from the deck a bunch of cards (about a dozen of them) and lay them out face downwards on the table in a rosette fashion. Several spectators, including the person who chose the card, rub their palms together to generate “special power”. They then “transfer” their powers to the performer by extending their fore-fingers and touching the back of his open palm. After being charged up with their power, the performer places his open palm on the cards laid out on the table. To everybody’s surprise, when he lifts up his hand, the entire bunch of cards adhere to his palm! The performer slowly turns his palm face upwards and the spectators can see the faces of the bunch of cards. None of them happens to be the chosen card. The performer proceeds to turn his palm face downwards once again. This time, all the cards drop off his palm except one card which he holds between his fingers and his thumb. It is the spectator’s selected card! You receive the special gimmicked card, and 2 accessories that are to be used with this gimmicked card. You also receive an instructional DVD in which Ryan teaches you everything you need to know how to perform this effect. You have to supply your own deck of bicycle cards. You need to specify, when ordering, whether you want the gimmicked card to be supplied with red or blue back bicycle card. The effect is easy to perform, and is quite angle-proof. It is reset instantly, and there is no force on the card to be selected. The entire effect can be considered as self-working. 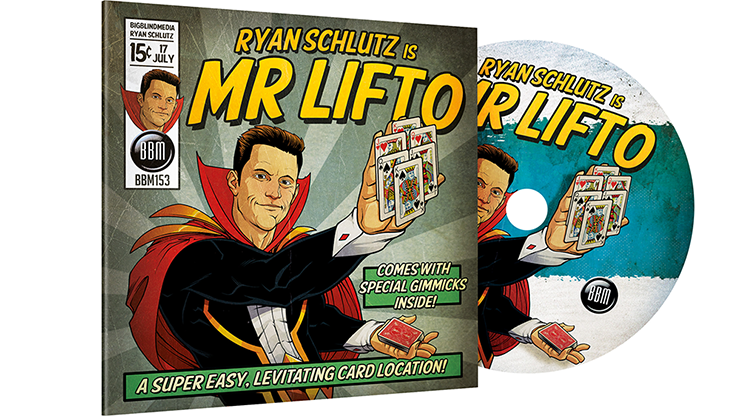 In Mr Lifto, you show your audience an impossible card stunt, and then you reveal their chosen card. 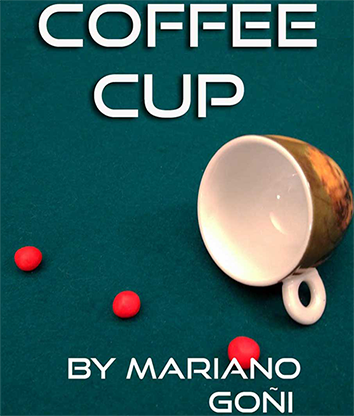 I have always been a fan of cups and balls, especially unique ones such as Mariano Goni’s. This routine uses 1 cup and 3 balls made of modelling clay. The routine starts with the performers VERY cleanly placing the 2 balls into the cup one at a time and keeping the 3rd ball away. The 3rd ball then re-appears inside the cup. This is repeated like the standard 2 in the hand 1 in the pocket type of routine, this happens for a few times until the last phase where a big ball appears as final load. I need to use Rene Lavand’s Cup and Ball routine as comparison as they are both very alike. They look very similar except for the last part where Goni’s have a final load and Lavand’s balls all disappears. In Lavand’s routine, he doesn’t use any gimmicks. Goni’s uses gimmicks. What I like about Goni’s routine is the clever way the routine is constructed. The gimmick is nothing new but it is very cleverly used. It helps to keep the ball in and release the ball as and when you like. Goni’s routine looks cleaner but the downside of the routine is that you have to sit down to perform and prep the table before performance. Lavand’s routine uses bread that is rolled into a ball, thus you can perform it anywhere and even impromptu. I was really intrigued by Goni’s routine initially but after comparing it with Rene Lavand’s routine, I think the gimmick used in Goni’s routine to achieve a cleaner look is rather negligible. I like both but given a choice, I’d use Rene Lavand’s routine. Rating 7.5/10. Its still a good routine, if you like playing with gimmicks, thus might be for you. The Gold Standard is basically a card to impossible location. In David Regal’s presentation, it can be much more than this. In effect, a card is freely selected (and can be signed) and lost in the deck. Magically, the chosen (and signed) card appears between the performer’s tie tack and his tie. The card can be pulled on or spun to show that it is indeed impaled onto the tie tack. The tie tack has to be removed from the tie before the card can be removed. And there is a hole through the card where the spike of the tie tack goes through. Here is a description of David Regal’s presentation. He has 2 spectators seated on opposite sides of him at a close-up table. He has spectator no 1 freely selects a card and then loses it in the deck. Only this spectator knows what card he has chosen. He then turns to spectator no 2, and has his back facing spectator no 1. He spreads the deck to show spectator no 2 that the chosen card is lost in the deck. Immediately spectator no 2 as well as the rest of the audience see the chosen card (signed or otherwise) impaled onto the performer’s tie tack. David then asks this spectator no 2 to concentrate and call out the name of spectator no 1’s chosen card. He acts surprised that this spectator is able to do so. 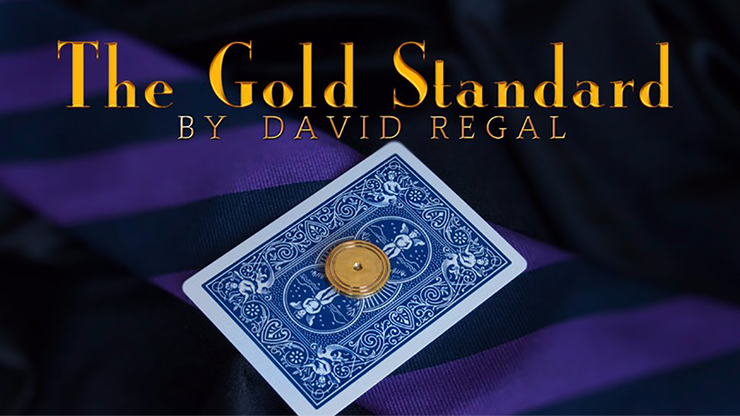 After a moment, from the laughter of the audience, David suddenly realizes that the chosen card is pinned in his tie tack. He removes the tie tack, and takes out the chosen card. There is a hole in the card. This presentation is very much like “paper balls over the head” where the audience can see what is happening except the spectator on stage, or in this case, spectator no 1 who is at the close-up table together with the performer. The performer can then continue with his close-up show. Somewhere in the show, another card, or another object, such as a bill, can be impaled on his tie tack. This is removed from the tie tack, and then further through his show, another object can get pinned onto his tie tack. This “visual gag” is like the “water of India” running gag that a stage performer uses throughout his performance. You receive the specially manufactured tie tack which is plated in 18k gold and comprises the tie tack and its clutch. You also receive a gimmick piece to be used with this tie tack. You are supplied with a carrying pouch as well as an instructional DVD. In the DVD, David Regal performs and explains everything with much clarity. For those who are interested in the history of such effect, they will be glad to know that David discusses quite a bit of it in his introduction. The effect is not difficult to do. David teaches you the Mahatma and other controls. There is no problem with performing angles, although it is best performed with the audience in front. Instead of playing card, a good alternative to use with The Gold Standard is your business card. Your spectator (or client) then gets to keep it with the special hole. The effect can be performed close-up or stand-up. The “card to tie tack” effect itself is a wow to the audience. If you do David’s routine, you get a comedy effect as well, similar to “paper balls over the head”. You can also use it as a running “gag” throughout your performance, much like “water of India”. The product is not cheap, but you get a very well made professional prop which is 18k gold plated. When you remove the tie tack and the pierced card, everything can be examined by the spectator. The good thing is that the pierced card can be given out as a souvenir to the spectator. After you fix the tie tack back onto your tie, in front of the audience, you are already set up and good to go again. Another coin bender, there are already many versions out there, is this for you? Read on. My last review of a coin bender was the Biobender, the Biobender was actually not bad. The gimmick is hidden in plain sight. As for Ox Bender, you will need to palm it to hide it. Palming it is no big deal as the gimmick is small. All coin bender’s end result is almost the same. The difference with using Ox Bender is that you only use 1 hand to bend it and the bent on the coin is curve and without any scratch marks. You can also bend spoons and keys (spiral twist). Loading the coin into the gimmick is also a breeze as the gimmick is designed in such a way whereby there is a guide built-in for easy load. I tested the Oxbender and the bend was pretty easy for me. Unlike Biobender, Ox Bender is able to bend thicker coins like Singapore’s $1 coin. Now for the downside, though you can bend thicker coins, you can’t bend embedded coins that is made of 2 metals, e.g. new S$1 coin. I asked a female colleague to try the bend and she says that she doesn’t have enough strength to bend it using 1 hand. In the explanation video, you are encouraged to train by squeezing the hand grip strengthener . 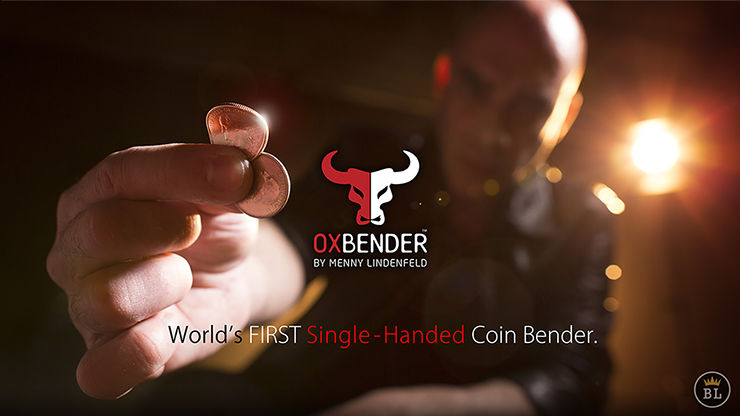 The Oxbender is a good coin bender (that is if you are strong enough to use 1 hand). What impresses me is the ability to spiral twist a spoon and a key. This is something that you can’t do with other coin benders. Rating: 8/10. Cool coin bender. Recommended. As its name suggests, Instant T is an instantaneous change of a playing card into a sachet of instant tea, complete with a string and the square paper label. It is also a card to impossible location. And where is the impossible location? Inside a sealed sachet of tea – one has to tear the sachet open in order to find the chosen card nicely folded into quarters, and attached to the string with the square label. This is how the basic routine looks like. A card is selected and then lost into the deck. The performer brings out his prediction card, but it is of the wrong back colour. Feeling rather disappointed, he changes it instantly into a sachet of instant tea. He then proceeds to tear the paper sachet. Inside it is the chosen card neatly folded into quarters and attached to a string connected to its small square label. The transformation of a playing card into the sachet of tea is indeed very visual. The performer handles the playing card freely, throwing it into the air and catching it with his hand. It does not appear to be prepared in any way. Yet, instantly, it changes into a sachet of tea and the performer is now holding the small square label complete with a string, and at the other of which is a paper tea sachet. This will catch any audience unaware. 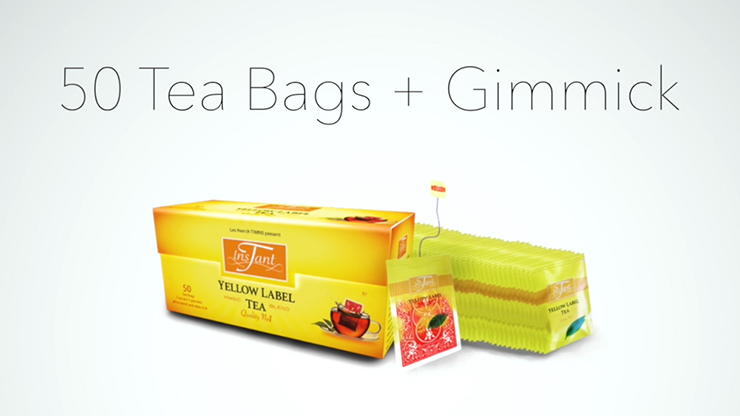 The transformed sachet of tea can be freely shown all around. This gimmicked sachet is sturdily made and should be able to last through many performances. Resetting the gimmick for the next performance is also very fast – it is a matter of a couple of seconds. The instructional videos are quite easy to follow, despite the fact that The French Twins speak with limited knowledge of the English language. They offer several variations in handling as well as in presentation. The chosen card can even be signed, or torn up into pieces and later one of its torn pieces that was retained matches with the restored card found inside the tea sachet. In order to do the signed card routine, you need to learn the Mercury card fold. This and other card sleights such as copping a card and different card forces, are well taught by the French Twins. There is a nice routine where one spectator selects a country, say, England, and another spectator selects USA. A playing card transforms into a tea sachet, tea being the favourite drink of the English people. Inside the tea sachet is the crown of a Coke bottle, Coke signifies the favourite drink of the American people. You are also taught in the video how to load small items, such as a finger ring, into the tea sachet. Instant T can be performed close-up, in a cabaret or stage setting. There is a mental effect where the performer is able to predict onto a spectator’s chosen card who this spectator is having tea with, and also the venue, time and date she is having tea with this person. The transformation of the playing card to a tea sachet cannot be performed surrounded. Some form of audience management is also required to present Instant T. However, the visual change of a playing card to a tea sachet itself is guaranteed to wow any audience. (8/10 star rating). Nu Flash is a very visual bill to playing card which can be used to change a bill to a single playing card, a name card, an envelope, a pile of cards or even a full deck. There are many visual card changes around. Most of them will just require you to throw the gimmick card into the air for the change to occur. 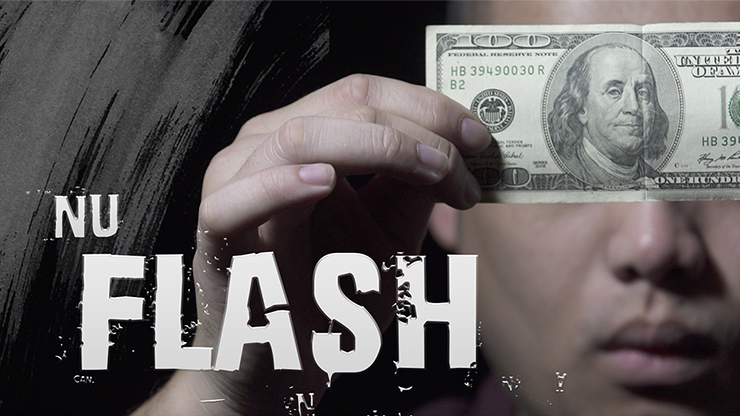 For Nu Flash, you’d need to do a few moves before the bill can be changed. If you are familiar with those that exist in the market, Nu Flash’s method is different, you’d need some practice to get it to be smooth. Nu Flash comes with an instructional DVD and a gimmick which has been prepared. All you need to do is to add your own bill. The DVD starts with teaching you how to prepare the gimmick and then teaches you several other ways to use the gimmick. There is also a non-bill version which seems to be like an after-thought thrown in as a filler. You’d have to take note that polymer bills will not work here. The DVD has Zamm Wong teaching it accompanied by Bond Lee asking questions to aid in the learning process. I find it very difficult to listen to what they were saying as the background music were at the same volume as their conversation. I like the visual change of this effect but I find that there must be a reason to justify the change from a bill to a card. If you’d use it just to change from a bill to a card and end there, I think that will not work, however, if it’s part of a longer routine, that’s fine. Rating: 6.5/10 At least they made an effort to provide a pre-made gimmick, unlike some who just throw in a DVD and sell.